Just like your lawn or garden, your plumbing system also needs regular maintenance to ensure that small problems don’t become a costly headache. Regular plumbing maintenance will also allow you to keep your plumbing system running in peak condition all year long. 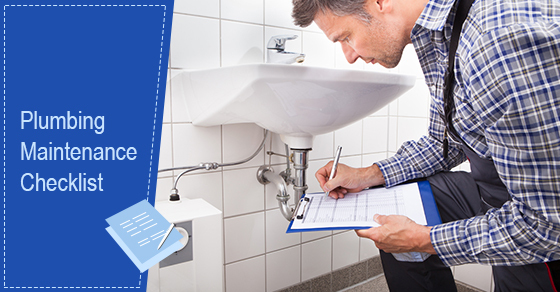 When it comes to plumbing maintenance, put the following things on your checklist. Every few months or whenever you notice that your bathroom drains are draining water slower than normal (this is a sign of a clog), take a few minutes to clean out your drains of any debris. If the clog doesn’t resolve with a mix of vinegar and baking soda, contact a professional. Also clean your kitchen sink drain regularly. The same applies to your P-traps. On a regular basis, simply remove and clean your aerators of the calcium buildup that can lead to both decreased water pressure as well as a haphazard spray coming out of your faucet. If you notice any signs of corrosion on your pipes, whether it’s blue/green deposits or rust, this is a sign that you will have a leak on your hands soon. Contact a professional as early as possible. Kitchen sinks and garbage disposals can regularly experience leaks due to the fact that they are constantly in use. Check for any signs of water damage. Remove the lid off of your toilet tank and inspect for any signs of wear. To keep your septic system running in peak condition, have it inspected on a regular basis. A professional will be able to tell you if you are in need of septic tank pumping. It is also important to maintain your sewer line and to look for signs that your sewer drain is about to clog. If you have a problem with tree roots, arrange to have sewer line snaking on a regular basis in order to prevent a full-blown clog. Every year, flush your water heater. If necessary, also replace the anode rod. Don’t forget to check the temperature and pressure relief valve. With a water pressure gauge, ensure that your water pressure is at a safe level, which is typically between 40-65 psi. If you come across a leak or other plumbing, heating or water problem during your inspection, contact Brothers Plumbing today. With over 50 years in the industry and affordable rates, we can help to get you back on track.